Why? To increase the capacities of our students for creative problem-solving and global collaboration, both virtual and physical, that produces tangible outcomes around issues of urgent importance. What? With their peers in Utrecht, students will co-create transdisciplinary research strands, events for public participation, and creative + scholarly + media outcomes for the purposes of discovery, visibility, and illumination. They will organize the exchange around the concept of the More-Than-Human-City, with the “more,” the “human” and the “city” all in need of articulation, elaboration, and exploration. One meeting in Semester 1 [December 10, 2018] to begin to brainstorm possible projects and intersections with our Utrecht colleagues. The virtual collaboration between the two research groups will begin, approximately, in early February. Utrecht Students will visit Hong Kong from (approximately) April 8 to April 12, 2019 and the Hong Kong Students will visit Utrecht from (approximately) May 26 to June 1, 2019. You must be available for the shared activities during the week of the Utrecht visit. This type of collaborative research will deepen your participatory understanding of the world and the possibilities for your own future work. Participants will receive Certificates of Accomplishment and will be able to share their experience in a number of different venues. You may, for instance, want upon your return to join our on-campus group of Nomadic Transdisciplinary Researchers. In addition, each participant, should the need arise, will receive a letter of recommendation for post-graduate study or jobs/internships placement from the Common Core Director. Costs? Participants will be responsible for all costs including hotel accommodation, airfare—the estimated economy return airfare between Hong Kong and Amsterdam, with KLM Royal Dutch Airlines, is HK$7,100—additional insurance, visa and in-country costs, etc. Each participant, however, will receive a subsidy of HK$7,000 from the Gallant Ho Experiential Learning Centre (http://ghelc.hku.hk/). Arrangements will be made to disburse 70% (HK$ 4,900) of the subsidy to support their participation prior to their departure for Utrecht. The remaining 30% (HK$2,100) will be disbursed upon their completion of the entire programme and the submission of a final written reflection. Failure to complete the entire programme shall result in withdrawal and/or reduction of financial subsidies as determined by the Common Core Office. All participants are required to stay at NH Centre Utrecht (https://www.nh-hotels.com/hotel/nh-centre-utrecht) during the exchange period in Utrecht. They will be required to make a prepayment to the hotel via the Common Core Office around 2 months before their departure. The price for a Standard Twin room (excluding breakfast) is approximately € 829.37 for the exchange period. Two Information Sessions, with the same content, will be offered on October 3 (Wed) and October 22 (Monday). 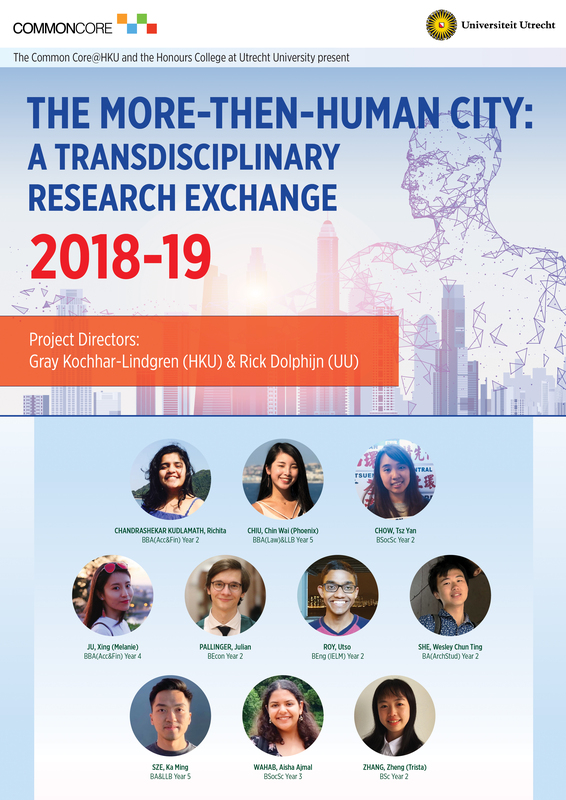 All applicants should submit a 500 word statement in which s/he demonstrates how s/he would most like to participate in a transdisciplinary research, exhibition, and event team as well as how s/he would most like to serve as a social change-agent in relation to the More-Than-Human-City. (Please do not assume that you have to completely understand this term ahead of time.) In addition, please include an updated CV; a student copy of the transcript of academic record; and a photograph. For details about obtaining a student copy of the academic transcript, please visit the website of the Academic Support and Examinations Section (http://www.ase.hku.hk/asoffice/). The application materials should be sent to commoncore@hku.hk with the subject line reading Common Core Transdisciplinary Research Exchange Application 2018-19.